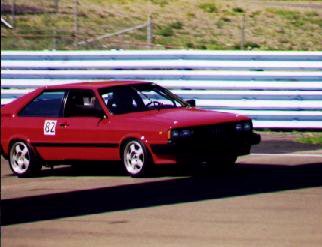 The car : 1981 Audi Coupe GT 2wd. I've owned this car for 16years and it still has only 86k on it. I've done a MC turbo retrofit, caged it , solid bushed all the suspension and reworked the brake system. Most of the mods will be outlined below. The body was completely repainted with a richer red than original, with a lustreous clear applied. Paint by Tottenham Garage in Ontario Canada. 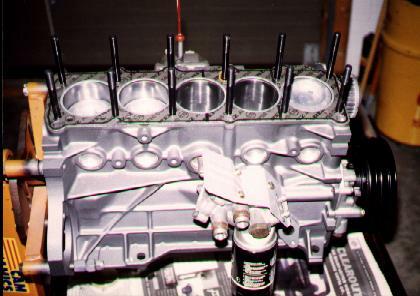 Every piece, nut and bolt on this car was removed, refinished or replaced during this project. 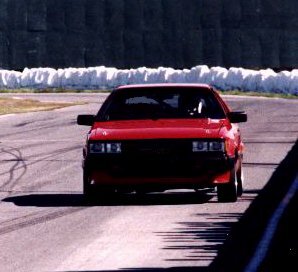 The parts for the engine retrofit came from a donor 5000 turbo Quattro supplied by #9 Auto Wreckers in Tottenham Ontario Canada. Please visit their website for used part inquiries. This car is basically reworked to be a track car for road courses. I have built it along those lines, lightening where I could and stiffening components. 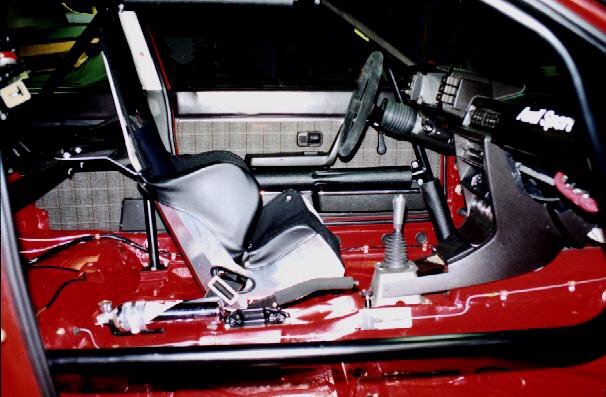 The biggest improvement was the installation of a SAFETY DEVICES rollcage. The cage is a six point bolt in kit meeting FIA standards. The rigidity of the chassis dramatically improved. I hope I never have to test out the integrity of it! Check out their site. 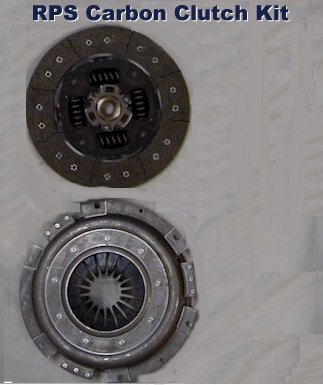 I wanted to run a small diameter flywheel and clutch assy for quicker revving, so I stayed with the 4000 set up. I found that under high boost that I could start slipping the clutch. Rather than go to larger heavier units, RPS Performance clutches made up a carbon disc for this car which never slips! It's also lighter than stock and allows for quicker smoother shifting as well. I highly recommend one of these for any modified car. Check out the link and see if they can help you! To keep things cool, I had GRIFFIN Radiator custom fabricate a aluminum racing rad for my car. They built it from my supplied drawings. It is beautiful piece with craftsmanship second to none. 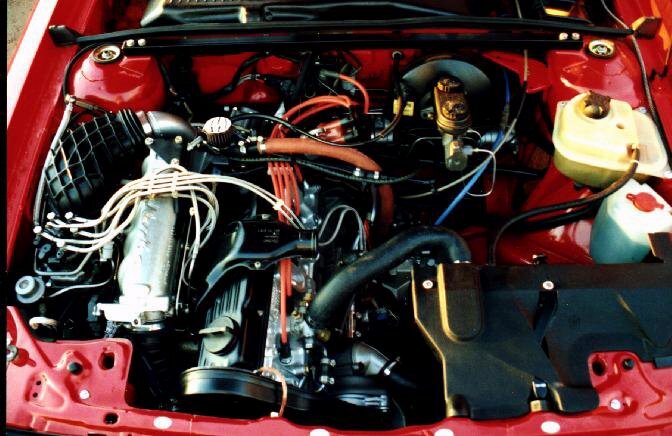 I've never had a cooling problem yet and you liquid cooled turbo turbo owners know how great that can be! Click on the link and check 'em out. They have off the shelf units for various applications and do custom work. They also supply NASCAR teams as well. 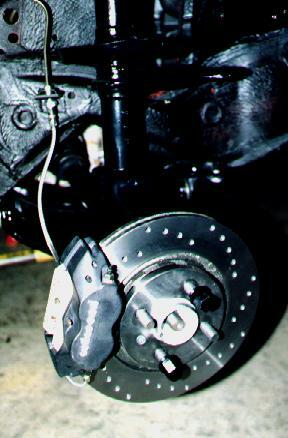 I reworked the brake system by converting the rear brakes to disc from a 1987 coupe. 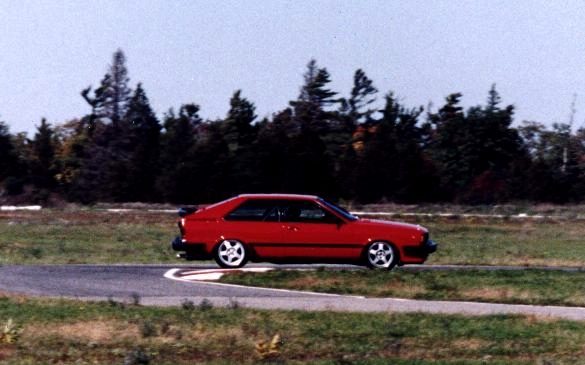 The fronts shown above, are 1990 corrado 11" rotors with WILWOOD DYNALITE 4 piston calipers. I made up weld on adapter brackets which look factory, to do this conversion. I have a WILWOOD cockpit brake bias adjustment within my reach. 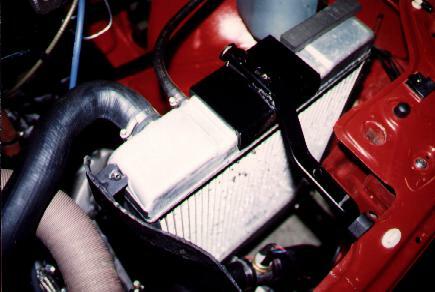 The master cylinder is a Dodge Daytona unit with 7/8" bore which is modified to fit. I have out-braked Porsches at the track with this set up. 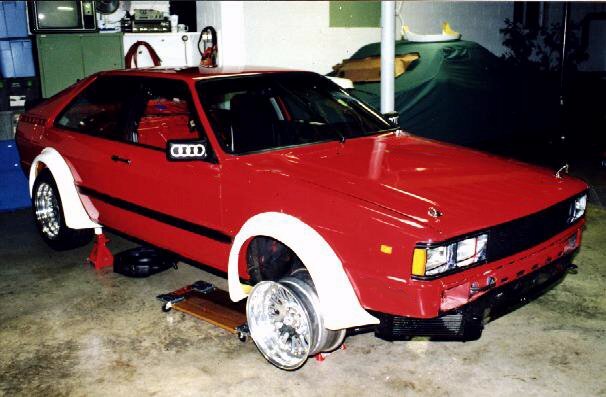 Presently the car is undergoing another change with the addition of fender flares and wider wheels. The flares are replicas of the ones used on the GROUPII coupe featured on the FIA coupe page. I have to thank John Bernardi Of Schomberg, Ontario for the quality job of reproducing the flares, without his skills I wouldn't have been able to attempt this stage of the project. The wheels are 16x9" modular forged by John Purner of COMPLETE CUSTOM WHEEL in Holly Hills Fla. These are very light at only 16lbs per rim. Please go to the link below to see pics of the modification.